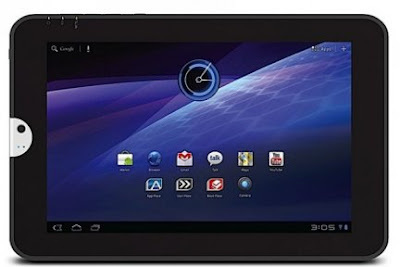 Toshiba has unveiled its Android Honeycomb tablet, called Toshiba Thrive. A 10.1-inch display, operating system, Honeycomb, powerful hardware and back interchangeable in different colors to change its appearance. In addition, the tablet has a 5 megapixel camera on the back, front 2-megapixel camera, USB and HDMI ports, SD slot for memory and Android 3.1. The three versions are Thrive 8GB ($ 429), 16GB ($ 479) and 32GB ($ 579). The battery is replaceable. Towards the end of the year we will also see a version 7 or 8.9 inches, with similar technical characteristics.